La Dermatología es una especialidad que puede ser prestada en el modelo de atención por telemedicina, ya que se basa en imágenes visuales fácilmente fotografiadas y se ha demostrado que dicho modelo ofrece ventajas para la valoración de pacientes en áreas remotas sin acceso al especialista. Cabe anotar que las fotografías deben tener ciertas especificaciones y estar acompañadas de datos clínicos de calidad. Dermatology is a very visual specialty that is suitable for telemedicine care since it is based on visual images easily photographed. The telemedicine care model offers advantages for the assessment of patients in remote areas without access to the specialist. Thus, we wanted to evaluate if it is a reliable modality for the diagnosis of tumor lesions in our geographical area. 1. Kanthraj GR. Newer insights in teledermatology practice. Indian J Dermatol Venereol Leprol. 2011;77:276-87. 2. Mehrtens SH, Halpern SM. Changing use and attitudes towards teledermatology in the UK over 10 years: Results of the 2016 National Survey. Br J Dermatol. Br J Dermatol. 2018;178:286-8. 3. Trettel A, Eissing L, Augustin M. Telemedicine in dermatology: Findings and experiences worldwide - a systematic literature review. J Eur Acad Dermatol Venereol. 2018;32:215-24. 4. Tan E, Oakley A, Soyer HP, Haskett M, Marghoob A, Jameson M, et al. 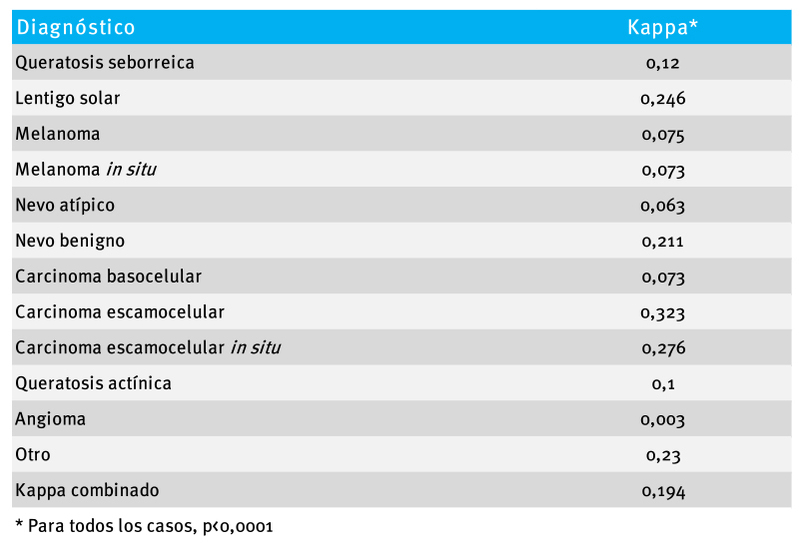 Interobserver variability of teledermoscopy: An international study. Br J Dermatol. 2010;163:1276-81. 5. 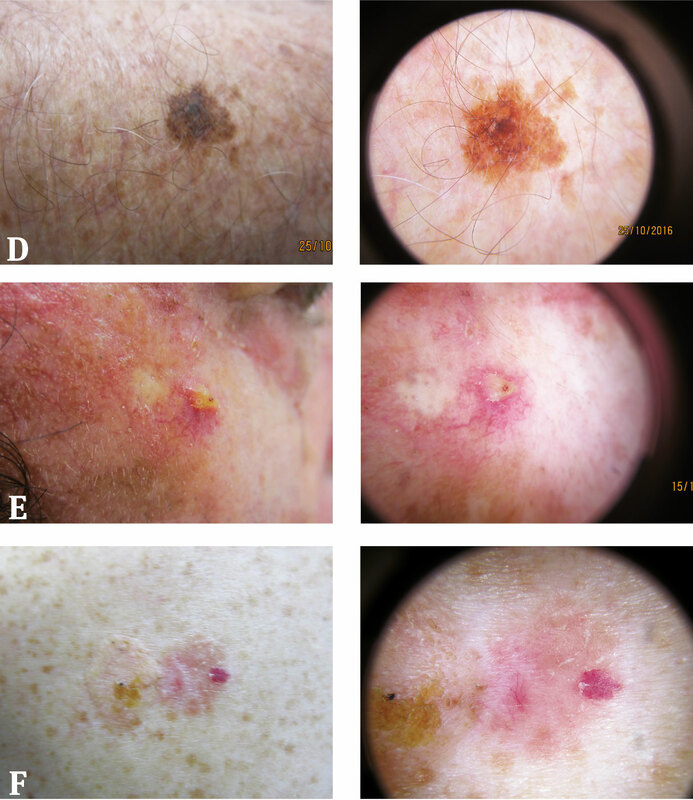 Tan E, Yung A, Jameson M, Oakley A, Rademaker M. Successful triage of patients referred to a skin lesion clinic using teledermoscopy (IMAGE IT trial): Teledermoscopy as triage for skin lesions. Br J Dermatol. 2009;162:803-11. 6. Bruce AF, Mallow JA, Theeke LA. The use of teledermoscopy in the accurate identification of cancerous skin lesions in the adult population: A systematic review. J Telemed Telecare. 2018;24:75-83. 7. Piccolo D, Smolle J, Argenziano G, Wolf IH, Braun R, Cerroni L, et al. 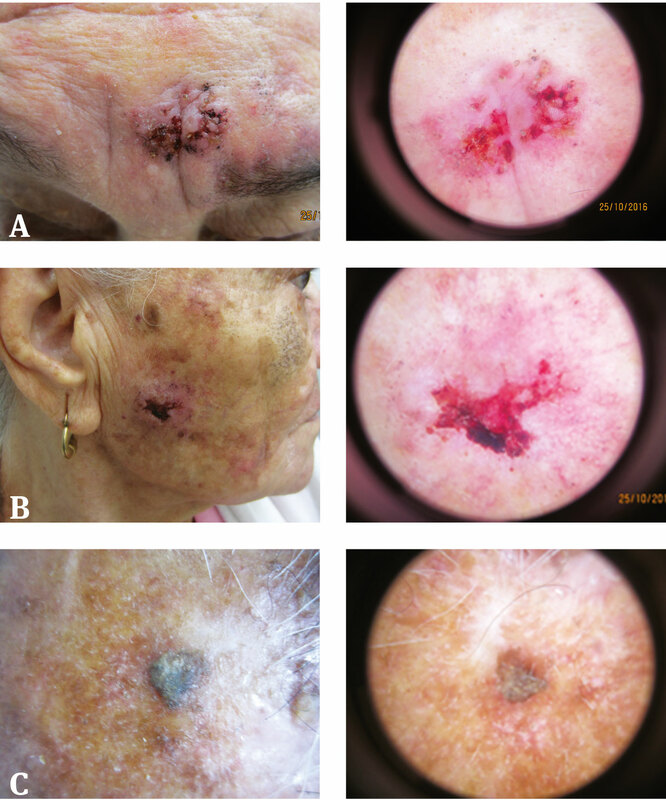 Teledermoscopy--results of a multicentre study on 43 pigmented skin lesions. J Telemed Telecare. 2000;6:132-7. 8. Warshaw EM, Gravely AA, Nelson DB. Accuracy of teledermatology/teledermoscopy and clinic-based dermatology for specific categories of skin neoplasms. J Am Acad Dermatol. 2010;63:348-52. 9. Ferrándiz L, Ojeda-Vila T, Corrales A, Martín-Gutiérrez FJ, Ruiz-de-Casas A, Galdeano R, et al. Internet-based skin cancer screening using clinical images alone or in conjunction with dermoscopic images: A randomized teledermoscopy trial. J Am Acad Dermatol. 2017;76:676-82. 10. Landis JR, Koch GG. The measurement of observer agreement for categorical data. Biometrics. 1977;33:159-74. 11. Piccolo D, Smolle J, Wolf IH, Peris K, Hofmann-Wellenhof R, Dell’Eva G, et al. Face-to-face diagnosis vs telediagnosis of pigmented skin tumors: A teledermoscopic study. Arch Dermatol. 1999;135:1467- 71. 12. Piccolo D, Soyer HP, Chimenti S, Argenziano G, Bartenjev I, Hofmann-Wellenhof R, et al. Diagnosis and categorization of acral melanocytic lesions using teledermoscopy. J Telemed Telecare. 2004;10:346-50. 13. Lamel SA, Haldeman KM, Ely H, Kovarik CL, Pak H, Armstrong AW. Application of mobile teledermatology for skin cancer screening. J Am Acad Dermatol. 2012;67:576-81. 14. Markun S, Scherz N, Rosemann T, Tandjung R, Braun RP. Mobile teledermatology for skin cancer screening: A diagnostic accuracy study. Medicine (Baltimore). 2017;96:e6278. 15. Warshaw EM, Gravely AA, Nelson DB. Reliability of store and forward teledermatology for skin neoplasms. J Am Acad Dermatol. 2015;72:426-35. 16. Finnane A, Dallest K, Janda M, Soyer HP. Teledermatology for the diagnosis and management of skin cancer: A systematic review. JAMA Dermatol. 2017;153:319-27. 17. Börve A, Terstappen K, Sandberg C, Paoli J. Mobile teledermoscopy-there’s an app for that! Dermatol Pract Concept. 2013;3:41-8. 18. 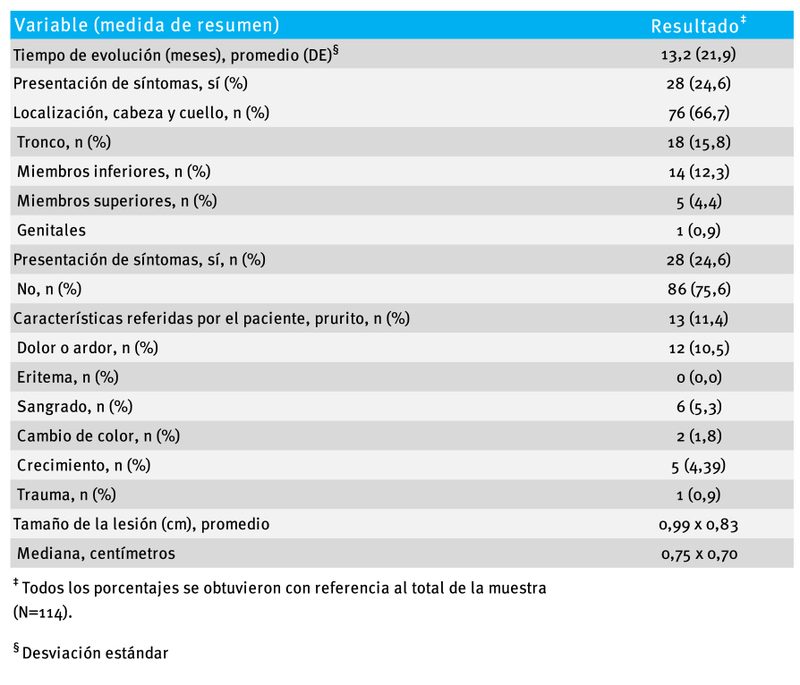 Velásquez MM, Zuluaga A. Primera jornada de detección precoz del cáncer de piel, Asocolderma, 2011, reporte de la experiencia en Medellín, Colombia. Rev Asoc Colomb Dermatol. 2012;20:135- 46. 19. Walocko FM, Tejasvi T. Teledermatology applications in skin cancer diagnosis. Dermatol Clin. 2017;35:559-63. 20. Mora O, Olmos E, Rochel C, Torres M, Rodríguez N. Acuerdo entre el examen dermatológico directo y teledermatología asincrónica. Prueba piloto, Hospital de San José, Bogotá, D.C., Colombia. Revista Repertorio de Medicina y Cirugía. 2012;21:122-5. 21. Arzberger E, Curiel-Lewandrowski C, Blum A, Chubisov D, Oakley A, Rademaker M, et al. Teledermoscopy in high-risk melanoma patients: A comparative study of face-to-face and teledermatology visits. Acta Derm Venereol. 2016;96:779-83. 22. Hue L, Makhloufi S, Sall N’Diaye P, BlanchetBardon C, Sulimovic L, Pomykala F, et al. Realtime mobile teledermoscopy for skin cancer screening targeting an agricultural population: An experiment on 289 patients in France. J Eur Acad Dermatol Venereol. 2016;30:20-4. 23. Kahn E, Sossong S, Goh A, Carpenter D, Goldstein S. Evaluation of skin cancer in Northern California Kaiser Permanente’s store-and-forward teledermatology referral program. Telemed J. 2013;19:780-5. 24. Lim D, Oakley AMM, Rademaker M. Better, sooner, more convenient: A successful teledermoscopy service. Australas J Dermatol. 2012;53:22-5. 25. Börve A, Gyllencreutz J, Terstappen K, Backman E, Aldenbratt A, Danielsson M, et al. Smartphone teledermoscopy referrals: A novel process for improved triage of skin cancer patients. Acta Derm Venereol. 2015;95:186-90. 26. 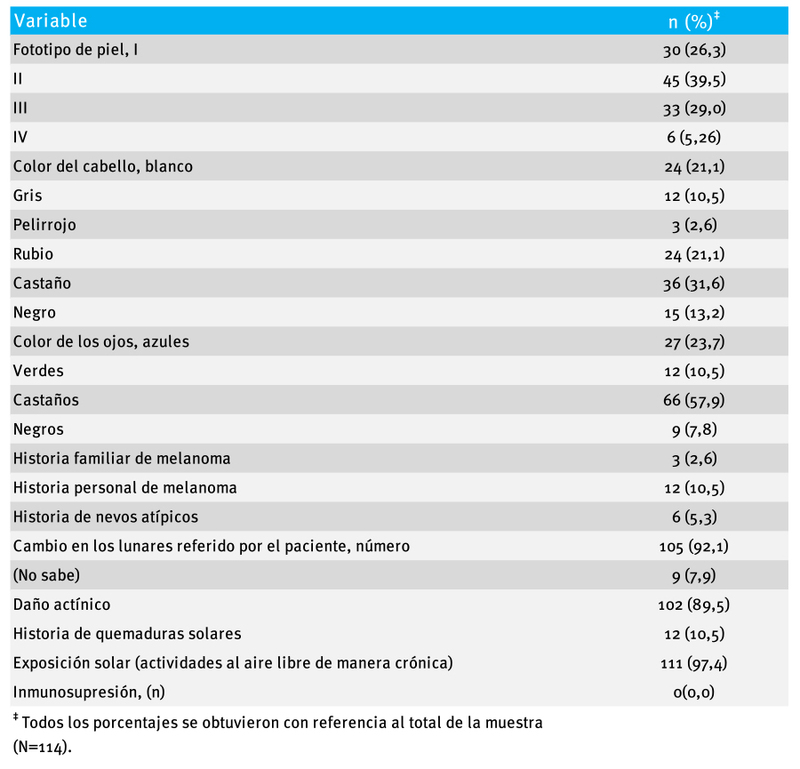 Moreno-Ramírez D, Ferrándiz L. A 10-year history of teledermatology for skin cancer management. JAMA Dermatol. 2015;51:1289-90. 27. Viola KV, Tolpinrud WL, Gross CP, Kirsner RS, Imaeda S, Federman DG. Outcomes of referral to dermatology for suspicious lesions: Implications for teledermatology. Arch Dermatol. 2011;147:556- 60. 28. Livingstone J, Solomon J. An assessment of the cost-effectiveness, safety of referral and patient satisfaction of a general practice teledermatology service. Lond J Prim Care. 2015;7:31-5. 29. Spinks J, Janda M, Soyer HP, Whitty JA. Consumer preferences for teledermoscopy screening to detect melanoma early. J Telemed Telecare. 2016;22:39-46.